It’s Monday! That’s the bad news. But it’s not really bad news because Mondays are just days, aren’t they, and we’re all in this together and it’s almost Hanukkah and also Christmas so let’s just get into it and make some cookies! Okay? Blondies are considered cookies, yes? I’m going with yes. Because they feel like a cookie in your hand. They taste like cookies. They’re chewy and substantial and tender, stuffed with butter (two and a half sticks! Get after it.) and and gingerbread spice, and also some white chocolate, too. Like cookies! They’re just, you know… square. And what’s wrong with being square, anyway? Huh? I mean, so what if someone a cookie is into re-reading Harry Potter on a Friday night and just saying no to drugs and wearing regular tops that aren’t cropped? …SO? I mean, um, layoff the cookies. They’re mine and I’m not good at sharing. 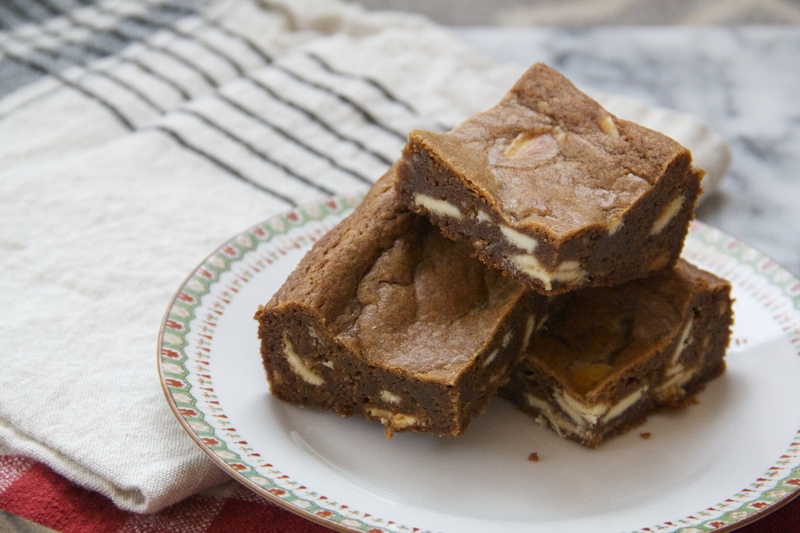 White Chocolate Gingerbread Blondies! To make your Monday a little bit sweeter. Warmer, too, and richer with spice. Happy almost-holidays! These are addictively good. I made them twice in one week and, towards the end, was wrapping them up and handing them out to everyone I saw just so I wouldn’t keep eating them. Beware. 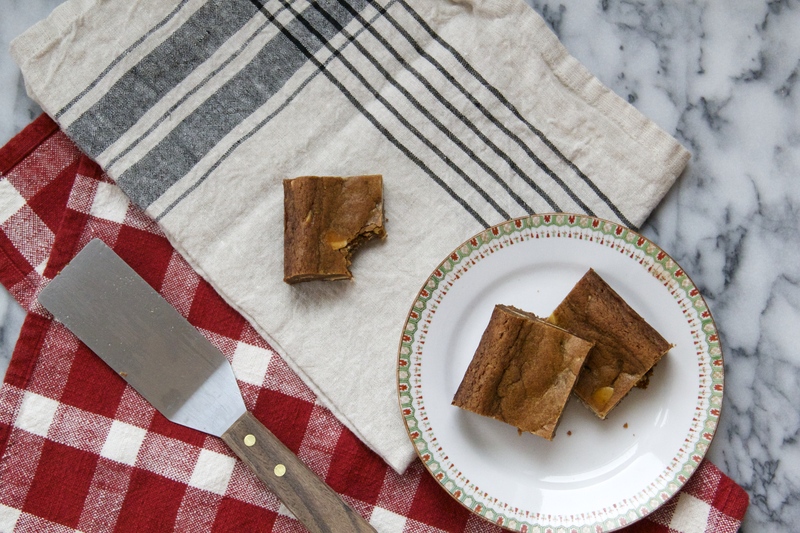 Preheat the oven to 350 degrees F, and coat a 9×13-inch rectangular baking pan with cooking spray. Line the pan with parchment, and then spray the parchment, too. In a medium bowl, whisk together the flour, baking soda, salt, cinnamon, ginger and cloves until well combined. Set aside. In the bowl of a stand mixer fitted with a paddle attachment (or large bowl if using hand-held mixer), cream together the butter and sugars until light and fluffy, about 3 minutes. Add the eggs and yolk, one at a time, beating well after each addition until smooth. Add the vanilla and molasses and continue mixing until incorporated. Add the dry ingredients and mix on low speed just until the dough comes together. Fold in the white chocolate. Spread the batter evenly into the prepared pan, smoothing the top with an offset spatula, and bake until the blondies are golden and a tester comes out mostly clean, about 30 minutes. 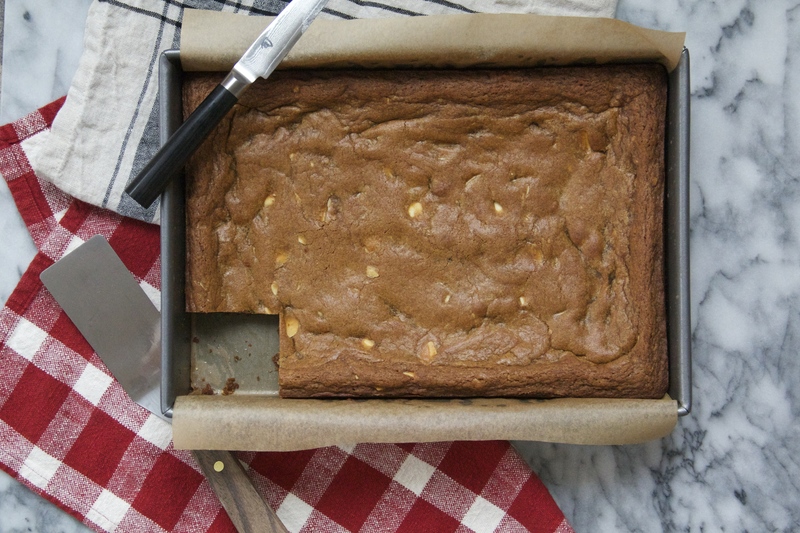 Let the blondies cool completely in the pan before slicing into squares and serving. 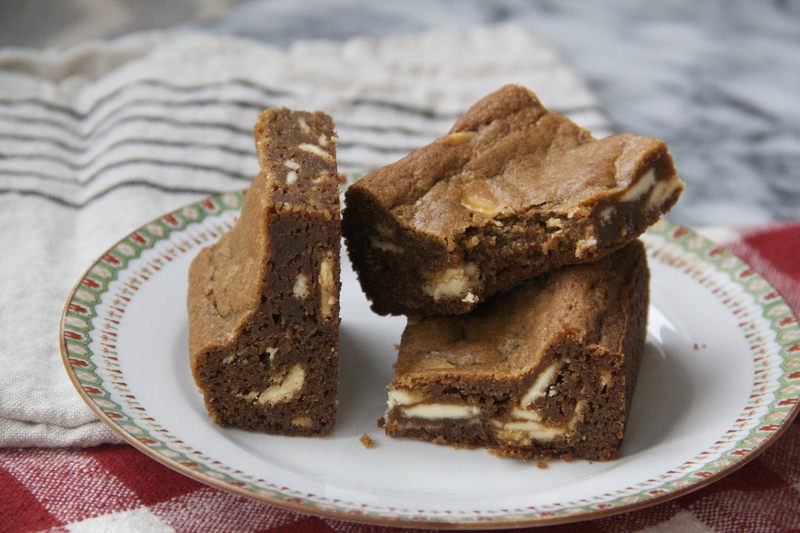 Blondies can be stored in an airtight container at room temperature for about a week. Makes about 25 medium squares. I might be really obsessed with these! I made them twice in three days. I’m going to experiment next w. a little less butter – I feel like they’re too oily. Will update!